Governor Greg Abbott has appointed Carlos Gallardo to the Texas Woman's University Board of Regents for a term set to expire on February 1, 2021. Governor Greg Abbott has appointed Carlos Gallardo to the Texas Woman's University Board of Regents for a term set to expire on February 1, 2021. Additionally, the Governor appointed Robert “Bob” Hyde and Stacie McDavid and reappointed Mary Pincoffs Wilson for terms set to expire on February 1, 2025. Carlos Gallardo of Frisco is a talent acquisition management and human resources executive. He is a member of Rotary International and the Federation of State Medical Boards. He is a former member of the Texas Medical Board, North Texas Society of Human Resource Management, North Texas Speakers Association, and the Rocky Mountain and Southwest associations of Colleges and Employers. Additionally, he is a member of the American Legion Post 178, Frisco, Reedy High School Band Booster Club, and the Reed High School PTA. He served as a Captain in the U.S. Air Force, and was honorably discharged. Gallardo received a Bachelor of Science from Texas Tech University in zoology and attended Webster University for post graduate studies. Robert “Bob” Hyde of Irving is a senior vice president for the Bank of Texas. He is a former board member of the Dallas Friday Group and a board member, former vice president, and treasurer of the Versailles Villas Home Owners Association Board. Additionally, he is a service member of Irving Family Promise and the Dallas Regional Chamber Public Policy, former service member of the Alzheimer's Association Greater Dallas Chapter and the University of Dallas National Alumni Board, and a former business community representative for the Irving Independent School District Improvement Committee. Hyde received a Bachelor of Arts in secondary education from the University of Dallas. Stacie McDavid of Fort Worth is CEO of McDavid Companies, a real estate and investment company which her family owns. She is a member of the National Cutting Horse Association, American Quarter Horse Association, National Reined Cow Horse Association, and the Texas Real Estate Association. Additionally, she is a member of the MD Anderson Board of Visitors, vice president of the National Cowgirl Museum & Hall of Fame, committee member of the MD Anderson Living Legends, and former co-capital campaign chair of the Fort Worth Museum of Science and History. McDavid received a Bachelor of Science from Texas Woman’s University. Mary Pincoffs Wilson of Austin is involved in her family’s privately run business. She is former chair of the Texas Woman's University Board of Regents and past president of Les Amis de Hospice Austin Board of Directors and West Austin Youth Association. She is former foster family chair for Helping Hand Home for Children and former chair of Austin High School's Guidance Committee. Additionally, she is a past member of the Helping Hand Home for Children Board of Directors and the Alzheimer's Association of Austin Gala Committee. Wilson received a Bachelor of Arts in English from The University of Texas at Austin and a Master of Arts in teaching from Emory University. These appointments are subject to Senate confirmation. Governor Greg Abbott today announced that nominations for the 2019 Star of Texas Awards, which honor peace officers, firefighters, and emergency medical first responders who were seriously injured or killed in the line of duty, are now open. Governor Greg Abbott today announced that nominations for the 2019 Star of Texas Awards, which honor peace officers, firefighters, and emergency medical first responders who were seriously injured or killed in the line of duty, are now open. Nominations must be submitted to the Governor's Office by June 15, 2019. “Each year, the State of Texas takes pride in recognizing our exemplary peace officers, firefighters, and emergency medical first responders,” said Governor Abbott. "This past year has undoubtedly tested our resilience, but the Texas spirit remains stronger than ever, and that is in-part due to the incredible work of the men and women in uniform serving their communities. These awards allow us to recognize and celebrate those who put their lives on the line every day to keep us safe." To be eligible for the 2019 award, the critical incident must have occurred between September 1, 2003 and June 15, 2019, and the first responder must not have previously received a Star of Texas Award. The preliminary investigation shows that the deceased, Aric Maxwell, attempted to cross N. IH-35 proper from westbound to eastbound when he was struck by a silver, 2016 Chevy Equinox traveling southbound in the inside lane. Aric Maxwell was transported to Dell Seton Medical Center at the University of Texas where he died from his injuries. The driver of the Equinox remained on scene and showed no signs of impairment. No charges are expected to be filed. Anyone with information regarding this case should call APD’s Vehicular Homicide Unit Detectives at (512) 974-5594. You can also submit tips by downloading APD’s mobile app, Austin PD, for free on iPhone and Android. This is Austin’s 22nd fatal traffic crash of 2019, resulting in 23 fatalities this year. At this time in 2018, there were 19 fatal traffic crashes and 20 traffic fatalities. These statements are from the initial assessment of the fatal crash and investigation is still pending. Fatality information may change. The preliminary investigation revealed that a 2005, white Chevrolet pickup truck was traveling northbound on FM 973 at the intersection of Pearce Lane when the driver ran a red light and struck the 2001, white Hyundai Elantra that was attempting to turn left on to FM 973 from Pearce Lane. The Chevrolet truck hit the Hyundai on the driver’s side. The driver of the Hyundai was transported to South Austin Hospital where she died a short time later. This is Austin’s 21st fatal traffic crash of 2019, resulting in 22 fatalities this year. At this time in 2018, there were 19 fatal traffic crashes and 20 traffic fatalities. The preliminary investigation revealed that a 2016, black Toyota 4Runner was exiting a private driveway at 8000 W. Hwy. 290. Signs are posted for right turn only and the driver of the 4Runner failed to comply and made a left turn. A 2008, gray Ford Mustang was traveling westbound in the inside lane and attempted to avoid the 4Runner but struck its front end. The Mustang continued into eastbound lanes of traffic and was struck by a 2013, maroon Dodge Ram. The driver of the Mustang was pronounced deceased at the scene. Anyone with information regarding this case should call APD’s Vehicular Homicide Unit Detectives at (512) 974-6935. You can also submit tips by downloading APD’s mobile app, Austin PD, for free on iPhone and Android. This is Austin’s 20th fatal traffic crash of 2019, resulting in 21 fatalities this year. At this time in 2018, there were 19 fatal traffic crashes and 20 traffic fatalities. Governor Greg Abbott has appointed Joyce Wilson as the presiding officer of the Camino Real Regional Mobility Authority for a term set to expire on February 1, 2021. Governor Greg Abbott has appointed Joyce Wilson as the presiding officer of the Camino Real Regional Mobility Authority for a term set to expire on February 1, 2021. The regional mobility authority is a political subdivision that allows local transportation planning and project delivery leaders to partner with the state to deliver transportation infrastructure projects that will serve the El Paso region. Joyce Wilson of El Paso is the CEO of Workforce Solutions Borderplex, a regional workforce development entity under the Texas Workforce Commission. She is a member of the National Association of Workforce Boards and is in a leadership position with the Texas Association of Workforce Boards. Additionally, she volunteers with the Boys and Girls Club. Wilson received a Bachelor of Science in business and economics from Virginia Commonwealth University and a Master in Public Administration from Harvard University. This appointment is subject to Senate confirmation. Governor Greg Abbott has reappointed Frank Parker, Jr. as the presiding officer of the Cameron County Regional Mobility Authority for a term set to expire on February 1, 2020. Governor Greg Abbott has reappointed Frank Parker, Jr. as the presiding officer of the Cameron County Regional Mobility Authority for a term set to expire on February 1, 2020. The regional mobility authority is a political subdivision that allows local transportation planning and project delivery leaders to partner with the state to deliver transportation infrastructure projects that will serve Cameron County. Frank Parker, Jr. is president and CEO of Parker & Company. He is a board member of the South Texas Manufacturing Association and a member of the Brownsville Economic Development Council, both the McAllen and Brownsville Chambers of Commerce, and the National Association of Customs Broker Forwarders Freight Forwarding Committee. Additionally, he is past chairman of the Brownsville Economic Development Council and the Brownsville Chamber of Commerce, past president of the Brownsville Propeller Club and past board member of the Border Trade Alliance. He is also a past member of the Brownsville Metropolitan Planning Organization. Parker received a Bachelor of Business Administration in Finance from The University of Texas at Austin. Governor Greg Abbott has appointed Harper Holland as the presiding officer of the Sulphur River Regional Mobility Authority for a term set to expire on February 1, 2021. Governor Greg Abbott has appointed Harper Holland as the presiding officer of the Sulphur River Regional Mobility Authority for a term set to expire on February 1, 2021. The regional mobility authority is a political subdivision that allows local transportation planning and project delivery leaders to partner with the state to deliver transportation infrastructure projects that will serve Lamar, Delta, and Hunt Counties. Holland Harper of Paris is president of Harrison, Walker and Harper, LP, a project management, construction, and engineering company established in Paris in 1887. He is an active member of the Church of the Holy Cross and spends his time supporting youth athletics and youth education in Lamar County. He served ten years in the U.S. Army Reserve, having received an honorable discharge in 2008. Harper received an undergraduate degree in international studies from Austin College in Sherman and a Master of Business Administration from Texas A&M Commerce, and graduated from the Owner/President Management Program at Harvard University. Governor Greg Abbott has named Ron Simmons presiding officer of the Texas Mutual Insurance Company Board of Directors. Governor Greg Abbott has named Ron Simmons presiding officer of the Texas Mutual Insurance Company Board of Directors. The company provides a stable, competitive source of workers' compensation insurance for Texas employers, acts as an insurer of last resort, and helps to prevent on-the-job injuries and illnesses and minimize their consequences. Ron Simmons of Carrollton is chairman of the Retirement Advisors of America and a former State Representative for District 65. He is a former board member of the American Legislative Exchange Council and has served on the Education Commission of the States. Additionally, he is the former vice chairman of the Autism Society of America. Simmons received a Bachelor of Arts in Business from Dallas Baptist University. Governor Greg Abbott today announced that Allstate Insurance Company will be expanding headcount in their facility in Irving, Texas. Governor Greg Abbott today announced that Allstate Insurance Company will be expanding headcount in their facility in Irving, Texas. Founded in 1931, Allstate is one of the largest insurance providers in the United States. The expansion creates 1,300 jobs and $11 million in capital investment. A Texas Enterprise Fund (TEF) grant of $2,600,000 has been extended to Allstate Insurance Company. “Irving’s healthy business climate allows the Irving Economic Development Partnership to retain valuable global companies while also attracting a talented workforce. Allstate’s decision to expand its presence is another example of the incredible momentum Irving-Las Colinas continues to experience as a hub for corporate business headquarters and corporate talent,” said Beth Bowman, President and CEO of the Greater Irving-Las Colinas Chamber of Commerce and Irving Economic Development Partnership. Read more about the Allstate Insurance Company. Location: Jollyville Rd. and Balcones Woods Drive. The preliminary investigation revealed that a white, 2018 Isuzu conventional truck was traveling northbound in the 1100 block of Jollyville road, approaching the intersection of Balcones Woods Dr. A white, 2015 Cadillac XTS was traveling westbound on Balcones Woods Dr. The Isuzu failed to control speed and entered the intersection striking the Cadillac on the driver’s side. The Isuzu continued across the intersection and struck the front of a gray, 2013 Mazda sedan who was facing south on Jollyville Rd. The driver of the Cadillac, Michael Cannatti, was transported to St. David’s Round Rock Medical Center where he died as a result of his injuries. This is Austin’s 19th fatal traffic crash of 2019, resulting in 20 fatalities this year. At this time in 2018, there were 19 fatal traffic crashes and 20 traffic fatalities. The preliminary investigation revealed that a tan, 1998 Chevrolet pickup truck was traveling northbound in the 5600 block of S. Congress Avenue. The truck was in the far right lane, getting ready to move into the turn lane to head east on Stassney Ln. The pedestrian was crossing from westbound to eastbound, mid-block, about 150 feet from a controlled crosswalk. The driver of the truck did not see the pedestrian prior to impact. The pedestrian, James Bourgeois, was pronounced deceased at the scene. The driver remained on scene and there were no signs of impairment. This is Austin’s 18th fatal traffic crash of 2019, resulting in 19 fatalities this year. At this time in 2018, there were 19 fatal traffic crashes and 20 traffic fatalities. On Wednesday, April 17, 2019 at approximately 7:39 a.m., Austin 9-1-1 received a call of a individual down behind the apartment complex at 9133 Northgate Blvd. Austin Fire, EMS and Police arrived and located Eddie Marshall with obvious trauma to his body. Despite efforts by Fire and EMS, Marshall succumbed to his wounds and was pronounced deceased at 8:02 a.m. by Dr. Remick. Homicide detectives were called to the scene and are currently investigating. Based on information developed this incident appears to be isolated with no threat to the public. Detectives are currently looking to speak with a Black male 30 years of age and a White female 36 years of age who were temporarily staying at the apartment complex. The Travis County Medical Examiner will conduct an autopsy tomorrow morning to determine the cause of death. Anyone with information about this incident is asked to call Crime Stoppers at 512-472-TIPS or text "Tip 103" + your message to CRIMES or use the new Crime Stoppers App or email APD Homicide at homicide.apd@austintexas.gov. You may remain anonymous. You can also submit tips by downloading APD’s mobile app, Austin PD, free on iPhone and Android. In honor of the 100 Club’s mission to support families of first responders killed or critically injured in the line of duty, the South Central Texas McDonald’s Co-op will host its 18th Annual Good Friday Fundraiser benefitting 100 Clubs of Central Texas and surrounding communities. On Friday, April 19, 2019 from 11 a.m. to 2 p.m., a percentage of the sales from all participating McDonald’s restaurants will be donated to local 100 Clubs. The Good Friday Fundraiser was established in 2001 to financially assist area 100 Clubs and support their mission of providing financial assistance to the families of first responders. It also serves as a way for first responders to interact with the community. “The 100 Clubs of Central Texas deeply appreciates McDonald’s for their continued support of our organization. We encourage everyone to join us at your local McDonald’s for lunch on Good Friday to show support for these vital members of our community,” added 100 Club of Central Texas Board Chair Billy Bryan. McDonald’s USA, LLC, serves a variety of menu options made with quality ingredients to more than 27 million customers every day. Nearly 90 percent of McDonald’s 14,000 U.S. restaurants are independently owned and operated by businessmen and women. Customers can now log online for free at approximately 11,500 participating Wi‐Fi enabled McDonald’s U.S. restaurants. For more information, please visitwww.mcdonalds.com, or follow us on Twitter @McDonalds and Facebook www.facebook.com/mcdonalds. Deceased person on Sixth St. Location: 115 E. 6th St.
On April 13 at approximately 4:19 a.m., Austin 911 received a call that a woman had fallen off a building. Austin Police and Austin-Travis County EMS arrived on scene. Ms. Benson was located lying on the sidewalk with obvious trauma and was unresponsive. ATCEMS attended to her however, she was pronounced deceased at 4:43 a.m. Homicide detectives were on scene and interviewed witnesses. The Travis County Medical Examiner has conducted an autopsy but is awaiting toxicology before making an official ruling. Based on all information collected this is a non-suspicious incident. If you have information about this incident or any other death you may call Crime Stoppers at 512-472-TIPS or text "Tip 103" + your message to CRIMES or use the new Crime Stoppers App or email APD Homicide at homicide.apd@austintexas.gov. You may remain anonymous.You can also submit tips by downloading APD’s mobile app, Austin PD, for free on iPhone and Android. Governor Greg Abbott today announced that Texas Instruments Incorporated (TI) will increase its presence in Richardson, Texas and build a new 300mm analog semiconductor wafer fabrication facility. Governor Greg Abbott today announced that Texas Instruments Incorporated (TI) will increase its presence in Richardson, Texas and build a new 300mm analog semiconductor wafer fabrication facility. TI is a leading global semiconductor design and manufacturing company that employs approximately 11,000 people throughout North America. Upon completion, the new facility is expected to create more than 488 jobs and represent more than $3.1 billion in capital investment. A Texas Enterprise Fund (TEF) grant of $5,124,000 has been extended to TI contingent upon the company fulfilling these investment and staffing commitments. Read more information about the Texas Instruments Incorporated. Governor Greg Abbott today issued a State Disaster Declaration for 9 Texas counties impacted by recent severe weather, including thunderstorms and tornadoes that caused widespread property damage and the loss of life. I, GREG ABBOTT, Governor of the State of Texas, do hereby certify that the severe weather event that began on April 12, 2019, has caused widespread and severe property damage and threatens loss of life, in Cherokee, Freestone, Houston, Leon, Madison, Nacogdoches, Robertson, San Augustine, and Shelby counties. 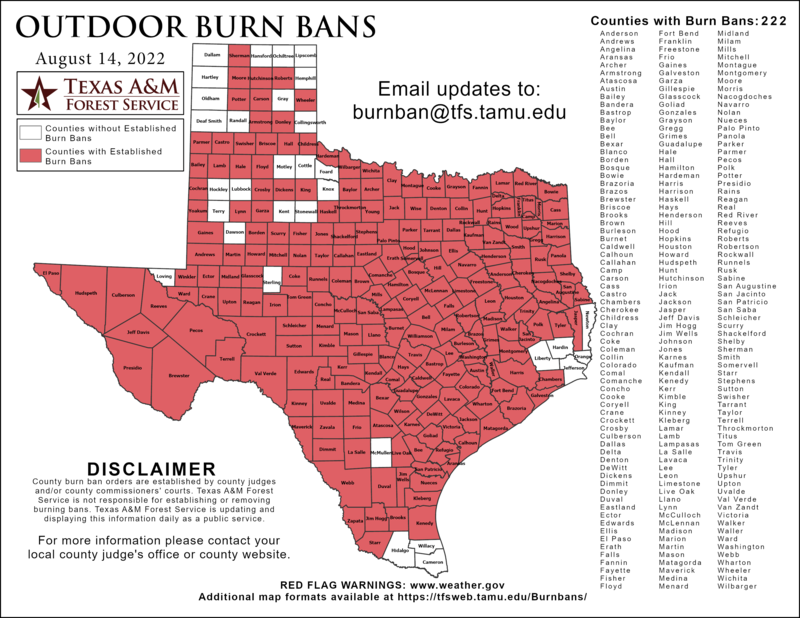 THEREFORE, in accordance with the authority vested in me by Section 418.014 of the Texas Government Code, I do hereby declare a state of disaster in the previously listed counties. IN TESTIMONY WHEREOF, I have hereunto signed my name and have officially caused the Seal of State to be affixed at my office in the City of Austin, Texas, this the 17th day of April, 2019. Governor Greg Abbott today issued a State Disaster Declaration for 9 Texas counties impacted by recent severe weather, including thunderstorms and tornadoes that caused widespread property damage and the loss of life. The Governor has authorized the use of all available resources of state government and of political subdivisions to aid in response efforts. Counties included in the disaster declaration are: Cherokee, Freestone, Houston, Leon, Madison, Nacogdoches, San Augustine, Shelby, and Robertson. Read the Governor’s full State Disaster Declaration.